What a fantastic start to the year Room 6 have made! First, they kicked off the term on the topic of Autumn. They were particularly fascinated by nature, and learnt all about how trees, birds, and certain mammals prepare for the Winter during the Autumn season. 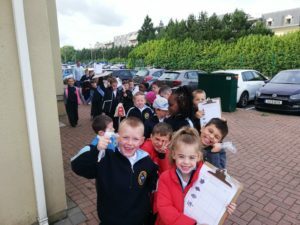 They read lots of non-fiction books about animals and nature, and learnt a few Autumn songs and poems in English and as Gaeilge- maith sibh! They went on a local nature walk to try and spot the signs of Autumn, made bird feeders to help the birds survive Winter, and complied wonderful fact files of their work. 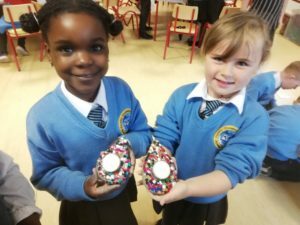 Click here to see some photos of them learning about Autumn, and celebrating the midterm in unusual style! Next the children delved enthusiastically into the topic of India, which they learnt is located in the continent of Asia. They researched its people, famous buildings, leader Gandhi, folktales and fiction, traditional dances, and of course it’s delicious food and spices! They were feeling so curious by the end of the topic, that they agreed to take part in a taste test, sampling some traditional Indian naan, spices, daal, chai tea and saffron cookies. Well done R6 on being so adventurous and open minded 😊 Finally, to celebrate all of their fantastic learning, and to mark Diwali, they made beautiful candle holders as seen below, and here! Next up, is the topic of the weather. R6 will be turning into meteorologists this month, and doing lots of research on how and why the weather changes each season. They will be making forecasts, spotting weather patterns, and might even set up their own weather channel- watch this space!